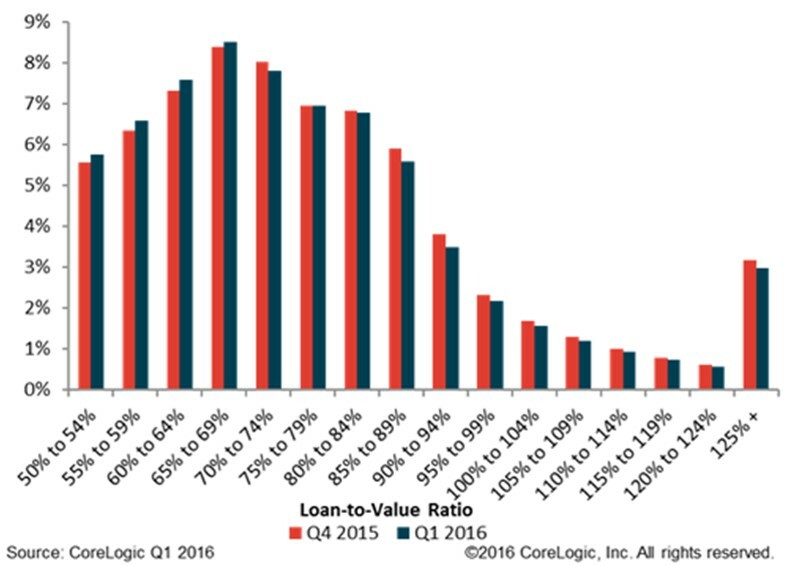 CoreLogic® (NYSE: CLGX), a leading global property information, analytics and data-enabled services provider, today released a new analysis showing 268,000 homeowners regained equity in Q1 2016, bringing the total number of mortgaged residential properties with equity at the end of Q1 2016 to approximately 46.7 million, or 92 percent of all mortgaged properties. Nationwide, home equity increased year over year by $762 billion in Q1 2016. The total number of mortgaged residential properties with negative equity stood at 4 million, or 8 percent of all homes with a mortgage, in Q1 2016. 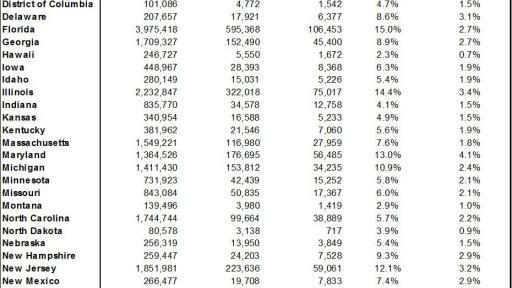 This is a decrease of 6.2 percent quarter over quarter from 4.3 million homes, or 8.5 percent, in Q4 2015* and a decrease of 21.5 percent year over year from 5.1 million homes, or 10.3 percent, compared with Q1 2015. 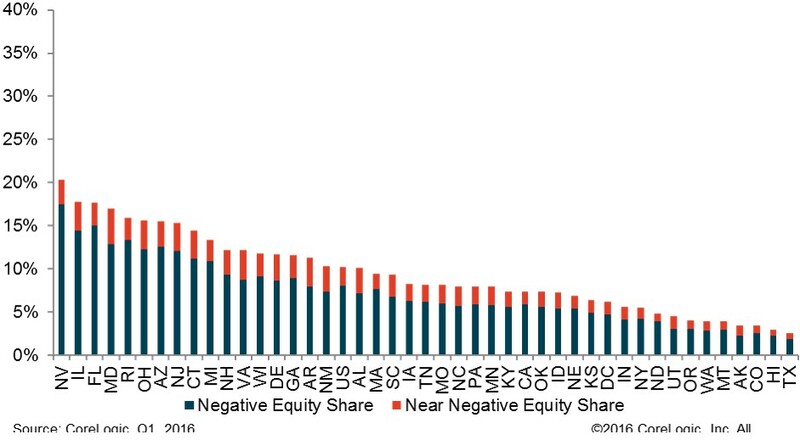 For the homes in negative equity status, the national aggregate value of negative equity was $299.5 billion at the end of Q1 2016, falling approximately $11.8 billion, or 3.8 percent, from $311.3 billion in Q4 2015. On a year-over-year basis, the value of negative equity declined overall from $340 billion in Q1 2015, representing a decrease of 11.8 percent in 12 months. Of the more than 50 million homes with a mortgage, approximately 9.1 million, or 18 percent, have less than 20 percent equity (referred to as “under-equitied”) and 1.1 million, or 2.2 percent, have less than 5 percent equity (referred to as near-negative equity). Borrowers who are under-equitied may have a difficult time refinancing their existing homes or obtaining new financing to sell and buy another home due to underwriting constraints. Borrowers with near-negative equity are considered at risk of moving into negative equity if home prices fall. 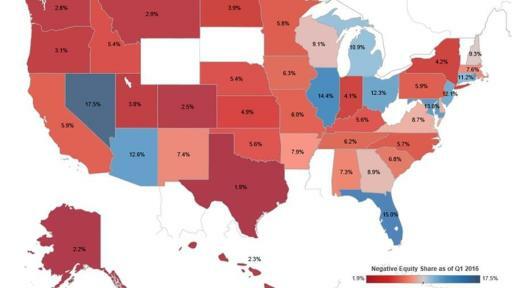 Nevada had the highest percentage of homes in negative equity at 17.5 percent, followed by Florida (15 percent), Illinois (14.4 percent), Rhode Island (13.3 percent) and Maryland (12.9 percent). 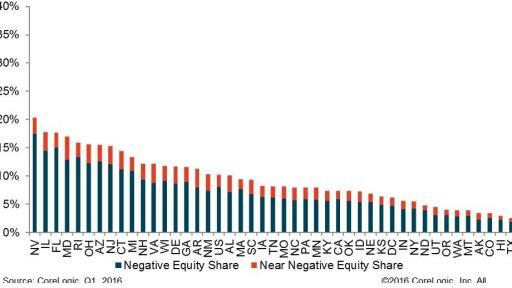 Combined, these top five states account for 30.2 percent of negative equity in the U.S., but only 16.5 percent of outstanding mortgages. 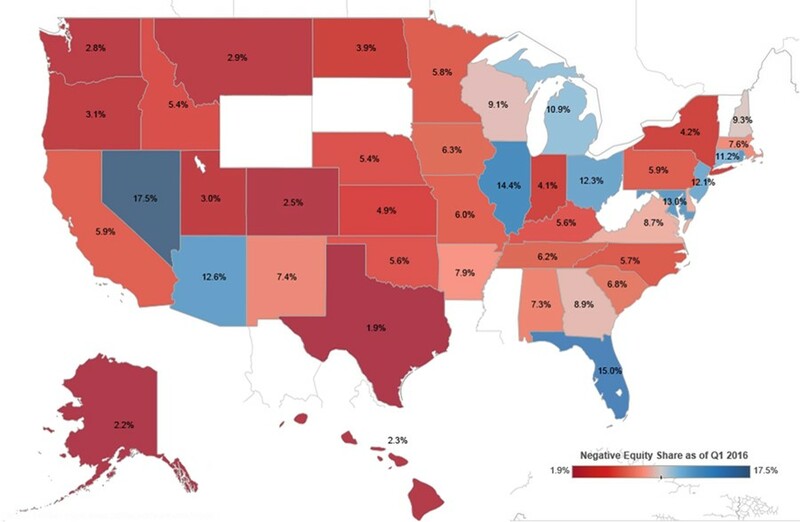 Texas had the highest percentage of homes with positive equity at 98.1 percent, followed by Alaska (97.8 percent), Hawaii (97.8 percent), Colorado (97.5 percent) and Washington (97.2 percent). 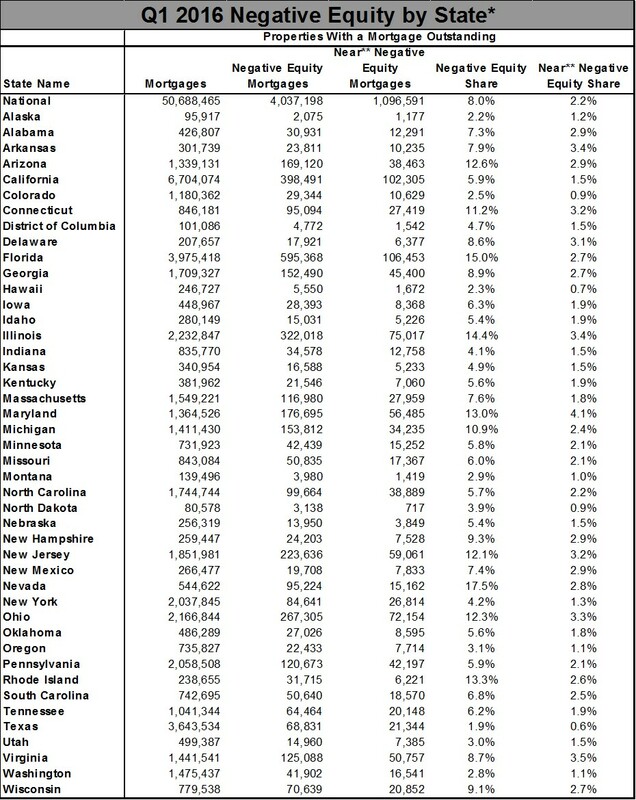 Of the 10 largest metropolitan areas by population, Las Vegas-Henderson-Paradise, NV had the highest percentage of homes in negative equity at 19.9 percent, followed by Miami-Miami Beach-Kendall, FL (19.6 percent), Chicago-Naperville-Arlington Heights, IL (16.7 percent), Washington-Arlington-Alexandria, DC-VA-MD-WV (10.9 percent) and New York-Jersey City-White Plains, NY-NJ (6 percent). Of the same 10 largest metropolitan areas, San Francisco-Redwood City-South San Francisco, CA had the highest percentage of homes in a positive equity position at 99.4 percent, followed by Houston-The Woodlands-Sugar Land, TX (98.3 percent), Denver-Aurora-Lakewood, CO (98.3 percent), Los Angeles-Long Beach-Glendale, CA (96.1 percent) and Boston, MA (94.3 percent). 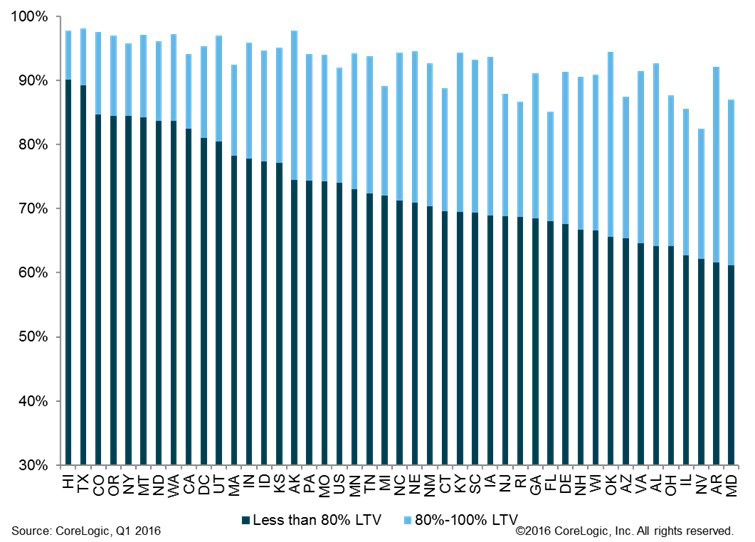 Of the total $299.5 billion in negative equity nationally, first liens without home equity loans accounted for $166 billion, or 55 percent, in aggregate negative equity, while first liens with home equity loans accounted for $134 billion, or 54 percent. 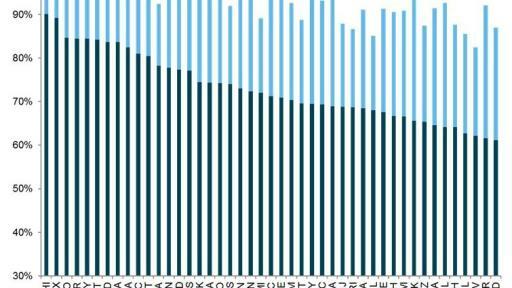 Among underwater borrowers, approximately 2.4 million hold first liens without home equity loans. The average mortgage balance for this group of borrowers is $244,000 and the average underwater amount is $68,000. 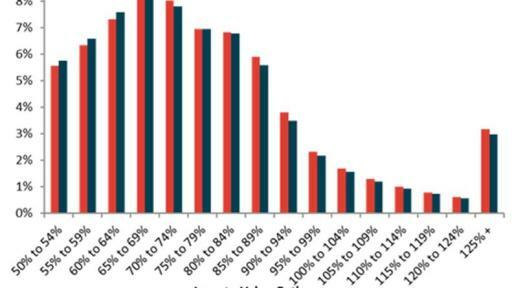 Approximately 1.6 million of all underwater borrowers hold both first and second liens. The average mortgage balance for this group of borrowers is $307,000 and the average underwater amount is $84,000. The bulk of positive equity for mortgaged residential properties is concentrated at the high end of the housing market. For example, 95 percent of homes valued at $200,000 or more have equity compared with 87 percent of homes valued at less than $200,000. *Q4 2015 data was revised. Revisions with public records data are standard, and to ensure accuracy, CoreLogic incorporates the newly released public data to provide updated results. *This data only includes properties with a mortgage. Non-mortgaged properties are by definition not included. The amount of equity for each property is determined by comparing the estimated current value of the property against the mortgage debt outstanding (MDO). If the MDO is greater than the estimated value, then the property is determined to be in a negative equity position. If the estimated value is greater than the MDO, then the property is determined to be in a positive equity position. The data is first generated at the property level and aggregated to higher levels of geography. CoreLogic data includes 49 million properties with a mortgage, which accounts for more than 85 percent of all mortgages in the U.S. CoreLogic uses public record data as the source of the MDO, which includes both first-mortgage liens and second liens, and is adjusted for amortization and home equity utilization in order to capture the true level of MDO for each property. The calculations are not based on sampling, but rather on the full data set to avoid potential adverse selection due to sampling. The current value of the property is estimated using a suite of proprietary CoreLogic valuation techniques, including valuation models and the CoreLogic Home Price Index (HPI). Only data for mortgaged residential properties that have a current estimated value is included. There are several states or jurisdictions where the public record, current value or mortgage data coverage is thin. These instances account for fewer than 5 percent of the total U.S. population. The data provided is for use only by the primary recipient or the primary recipient's publication or broadcast. This data may not be re-sold, republished or licensed to any other source, including publications and sources owned by the primary recipient's parent company without prior written permission from CoreLogic. Any CoreLogic data used for publication or broadcast, in whole or in part, must be sourced as coming from CoreLogic, a data and analytics company. For use with broadcast or web content, the citation must directly accompany first reference of the data. If the data is illustrated with maps, charts, graphs or other visual elements, the CoreLogic logo must be included on screen or web site. For questions, analysis or interpretation of the data contact Lori Guyton at lguyton@cvic.com or Bill Campbell at bill@campbelllewis.com. Data provided may not be modified without the prior written permission of CoreLogic. Do not use the data in any unlawful manner. This data is compiled from public records, contributory databases and proprietary analytics, and its accuracy depends upon these sources. CoreLogic (NYSE: CLGX) is a leading global property information, analytics and data-enabled services provider. The company's combined data from public, contributory and proprietary sources includes over 4.5 billion records spanning more than 50 years, providing detailed coverage of property, mortgages and other encumbrances, consumer credit, tenancy, location, hazard risk and related performance information. The markets CoreLogic serves include real estate and mortgage finance, insurance, capital markets, and the public sector. CoreLogic delivers value to clients through unique data, analytics, workflow technology, advisory and managed services. Clients rely on CoreLogic to help identify and manage growth opportunities, improve performance and mitigate risk. Headquartered in Irvine, Calif., CoreLogic operates in North America, Western Europe and Asia Pacific. For more information, please visit www.corelogic.com.